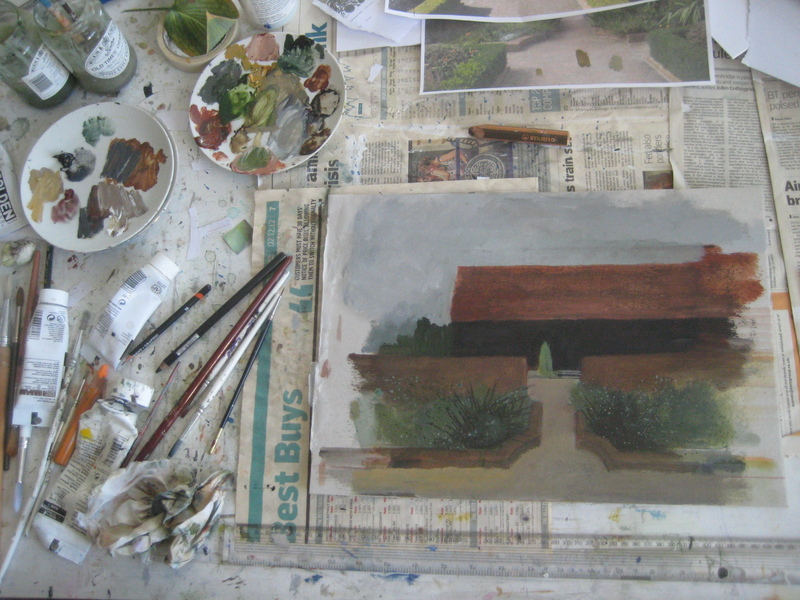 How difficult can it be to produce 4 paintings for a project? Pretty,pretty,pretty hard as Larry David would most likely say if he were here, which of course he isn’t although I could certainly do with a bit of assistance – not that he’d be very helpful…….although he is funny. However I digress – my room always looks like this after a few days of work I am being slowly edged off any work space by paint / paper / brushes / pencils / pens…….. I’ll be pushed along until I only have a couple of inches of space and it’ll end up with all the tubes of paint and brushes becoming animated like the Sorcerer’s Apprentice scene flying around and attacking me for not treating them properly and putting their tops back on and leaving brushes in water and all the other things I didn’t oughter! This entry was posted in acrylic, Art, artists, Buildings, Drawing, Exhibitions, Gardening, Life, Living in North London, London, Painting, Royal Society of British Artists, Royal Watercolour Society, Uncategorized. Bookmark the permalink. You’ve no idea how comforting that post is! I can so relate to it even if I don’t paint. We always think we’re the only one with a particular problem. Love it Jill. 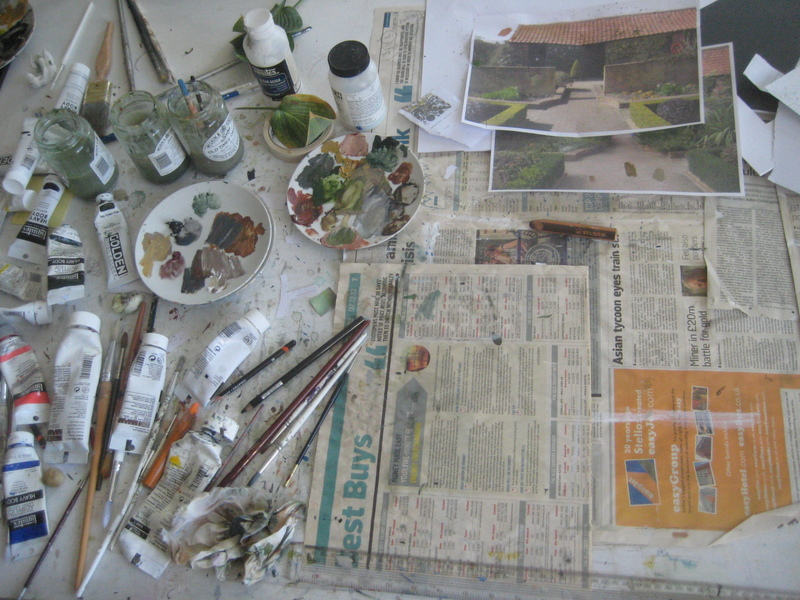 Is `Martin’s studio any tidier? Love it Jill. 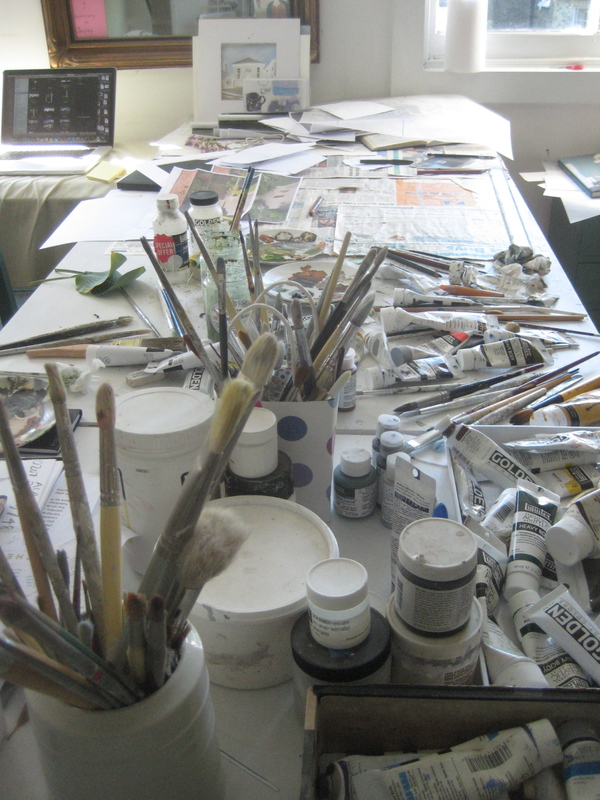 Is Martin’s studio any tidier? Some days I put all my tools tidily away in their places and other days I just think whatever …….